food they need, every day. In Montana, 1 in 5 children struggle with hunger. That’s 45,700 kids in Montana as well as their families. For children at risk of hunger, the number doubles to 92,000 children that have experienced hunger and lack access to nutritious foods at various times each week and month. 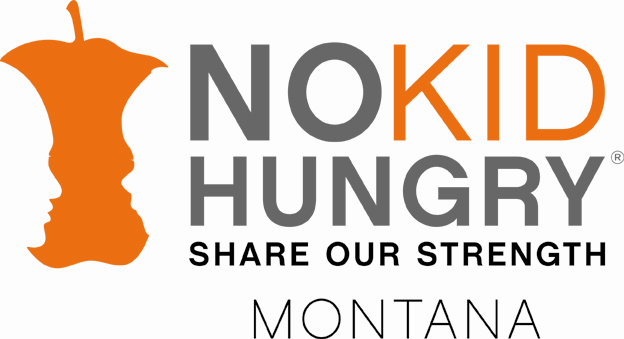 The Montana No Kid Hungry campaign was launched in February of 2012. The mission is to end childhood hunger in Montana by ensuring all children get the healthy good they need, every day. This is a public-private-partnership between the Montana Governor’s Office, the Department of Public Health and Human Services, and Share Our Strength. Share Our Strength is a national non-profit association that funds No Kid Hungry State Partners. Essentially, this campaign connects kids to healthy food through improving access to healthy food and nutrition education. To accomplish this work, the campaign collaborates with many organizations and individuals across Montana. Collaboration is the key to success. As a first effort towards seeking to better align the work of public agencies, private and nonprofit organizations in addressing childhood hunger across the state, No Kid Hungry hired a public consulting firm, Public Knowledge, to complete a Community Assessment. The assessment explores some of the unique challenges Montanans face in accessing food. Montana No Kid Hungry brings a lot of resources to the table for programs identified as high priority to make the most impact through increasing the number of sites and increasing participation. In 2013, the campaign’s 2 main priorities with improving access to healthy food included the Summer Meal Program and the Afterschool Meal Program. In January 2012, there were only 7 Afterschool Meal Programs which has doubled to 14 programs in just 1.5 years. This results in serving 1200 more kids and almost 13,000 more meals. In summer of 2012, there were 167 Summer Meal Program sites across Montana and five sites were added in 2013 raising the total to 172 this past summer. This is significant after a decline of 24 sites last summer. In addition, nineteen mini-grants were awarded to Summer Meal Program sponsors for a total of over $50,000 and a planned participation increase of over 70,000 meals this past summer. To address the nutrition education piece, No Kid Hungry rolled out Share Our Strength’s Cooking Matters at the Store program to teach families how to buy healthy foods on a budget. No Kid Hungry, SNAP-Ed and EFNEP Nutrition Educators, and a few WIC agencies implemented the Cooking Matters at the Store program in their respective counties/communities. The Director of Montana No Kid Hungry is also a co-chair of the Montana Partnership to End Childhood Hunger, which is a group of diverse representatives from public and private food programs, agriculture, faith groups, businesses, foundations, academic and medical representatives that work together towards ending child hunger in the state. This coalition developed a 10-Step Plan to End Childhood Hunger with specific actions that deal with public and private food assistance programs, and many other factors that can impact access to healthy food for children. In September 2013, a state-wide Summit to End Childhood Hunger was organized by the Montana Partnership to End Childhood Hunger as an effort to build community action groups and give these groups the resources needed to return to their communities and take action. Montana No Kid Hungry partners with Share Our Strength, the Governor’s Office, MT DPHHS, Montana Partnership to End Childhood Hunger, MT Child and Adult Care Food Program, MT Office of Public Instruction, Montana Food Bank Network, Family Career and Community Leaders of America, and CHAMPS.